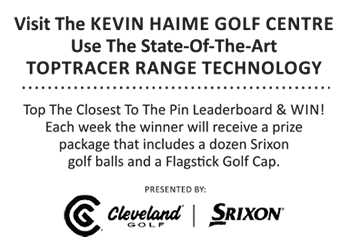 BELLEVILLE, ON (Via PGA of Canada – Ontario Zone) – Hadley does it again, and becomes the third Professional to win the TaylorMade & Adidas Ontario Zone Championship 4 times. He joined Danny King and Herb Holzscheiter in accomplishing the feat. National Partners TaylorMade and adidas support a major Championship in all nine PGA Zones which sees the winner receive an early exemption into the PGA Championship of Canada in 2019. At the end of day one three-time champion, Brian Hadley of Thames Valley Golf Club and Nick Kenney of the National Golf Club of Canada led the TaylorMade & adidas Ontario Zone Championship at 6-under 66. Tied for 2nd at 3-under 69 were four-time champion Danny King, along with Victor Ciesielski. Ontario is experiencing a warmer than usual summer so far with many days over 30 degrees and the last two days were no different. On Tuesday the wind wasn’t blowing quite as much which made it feel even warmer so players looked forward to enjoying a can of Triple Bogey, the Official Beer of the PGA of Ontario and a meal. The lead group made up of all previous PGA of Ontario winners (Hadley, Kenney and King) are used to playing under pressure. “Everyone was playing well in the group and making birdies so it was a good atmosphere to be in,” shared Hadley. But even the winner doesn’t always hit the fairway, saying his best shot may have been the punch out of the trees on 14 and the holing out from 40 yards. Brian carded 7 birdies in his first round and 4 birdies and an eagle on day 2 for a two-day total of 9-under for the tournament. It was back in 2013 when Brian hoisted the trophy for the second time and became known as Mr. 59. It was at Deer Ridge Golf Club on the 18th hole, playing 490 yards that Brian hit a 2 hybrid to a back right pin to 4 feet and converted the eagle putt to shoot 59. “It’s always an honour to win the PGA of Ontario Championship but to be only the third person to win four times is truly special to me and I look forward to 2019 to try to defend.” said the champion. Brian took home $5,000 and 100 points in the Chase to the Breenie Cup.